Choosing the right mattress for your baby is an issue of vital importance for his or her rest and development. Therefore, in the following article, we'll tell you what details to keep in mind when mattress shopping. Babies spend many hours in their crib. While choosing the right crib is an important decision, finding the right mattress is also crucial. You need to make sure to choose a mattress for your baby that provides maximum comfort and security. Unlike mattresses for children and adults, mattresses for babies need to be very firm. Keep in mind that soft surfaces present a suffocation risk for small babies. Furthermore, they increase the risk of sudden infant death syndrome (SIDS). Unfortunately, this is also true when mattresses don’t fit correctly in a baby’s crib. In fact, when you choose a mattress for your baby, you should make sure that, among other things, that it provides a safe environment for sleeping. Remember that babies can turn face down in their cribs, which can make breathing difficult. Therefore, it’s also important to find a mattress that’s breathable. In today’s article, we’ll look at this and a number of other factors parents should keep in mind when shopping for a mattress. Take note so that you can be sure your little one is resting safely and comfortably. First of all, your baby should use a mattress that’s firm, flat, and protected by a water-proof cover. This will help keep the mattress clean and dry, since you can easily remove and wash the cover. 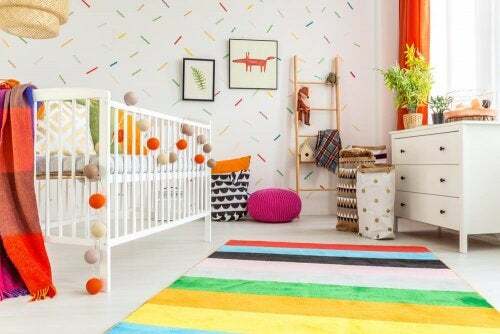 Make sure that the mattress is in good shape and fits your little one’s crib perfectly. A mattress that fits poorly is very dangerous. In fact, when a mattress is too small in comparison to the crib, your baby can slip into the gap and become trapped between the crib and the mattress. A mattress that is too big for a crib is also dangerous. What’s more, it will make it very uncomfortable to change the sheets on a regular basis. There’s no denying that your baby’s mattress will get dirty often, since diapers aren’t 100% fail proof and tend to leak on occasion. Therefore, you’ll save yourself a lot of time and hassle if the mattress you choose has a removable, washable cover. Another detail to keep in mind is that you should stay away from mattresses that are too heavy. A heavy mattress will make changing the sheets regularly a difficult task. In general, it’s best to change your little one’s bedding once or twice a week. Of course, this doesn’t mean you should opt for a thin, low-quality mattress that won’t last. Rather, look for something that’s firm, but not overweight. Lastly, it’s very important that mattresses have proper venting. That way, they’ll allow a better circulation of air within their structure. Therefore, make sure that the mattress you choose has small openings. These little vents serve an important purpose: Preventing the accumulation of unpleasant smells. This further assures your little one’s comfort. When it comes to the safety and comfort of your baby, there’s no denying that breathable mattresses are the safest and healthiest option. Among other reasons, breathable mattresses allow for constant airflow. Therefore, there is no overheating or buildup of moisture, thus preventing the growth of mold and germs. Unfortunately, babies can sometimes turn over in their cribs, which can make it difficult for them to breathe. A breathable mattress works in such a way that the surface is perforated. This means that airflow is continuous, and your baby will be able to breathe, even if face down. The use of organic materials further guarantees that your baby’s mattress meets all the requirements of comfort and safety. While experts insist that babies are safest when sleeping on their backs, a breathable mattress will offer maximum security in case your little one rolls over. What are the benefits of using a breathable mattress? Sleeping face down can be dangerous for babies, since there’s a risk of suffocation if they stay that way for some time. Therefore, the design of a mattress is key in keeping that from happening. Breathable mattresses reduce the risk of suffocation considerably. Breathable mattresses allow air to flow in and out. Keeping in mind that germs are normally present in moist areas, the perforated surface prevents moisture from accumulating. Therefore, mold and bacteria are less prone to form. Traditional crib mattresses can cause a baby’s body to overheat and sweat while sleeping. In fact, the heat that results from traditional mattresses is one of the main causes of babies overheating. But this doesn’t happen with breathable mattresses because airflow keeps heat from becoming trapped in your baby’s body and the mattress’s surface. Finally, remember that, when it comes to choosing the right mattresses, it’s also important to use breathable sheets and covers. In this sense, you should avoid using waterproof pillows and sheets, as they can impede airflow. What’s more, they often contain materials that are responsible for toxic emissions.